Now open in the Caesars Palace resort and Casino, one of the best French chefs of them all has arrived in Vegas. The best dishes to order are the Guy Savoy classics such as the roasted veal chop and the artichoke soup with black truffle accompanied by a mushroom brioche. (Feedback that the guinea hen cooked in a pig's bladder is nothing short of amazing is also commonplace.) The ultra-modern dining room with the cathedral-high ceiling is absolutely stunning. 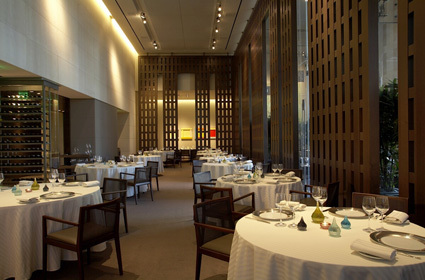 The tables are well spaced; the service is warm, friendly, and thoroughly professional.